Leigh Bardugo’s Grishaverse trilogy is hugely popular amongst Young Adult readers. Her world building is considered to be some of the best within the YA Fantasy genre. Personally, I like the original trilogy but I wouldn’t consider myself a huge fan. I am however a fan of one particular character, Nikolai. When I heard about King of Scars I definitely wanted to read it. I was not surprised that Illumicrate wanted to create a special edition book box for it’s release. 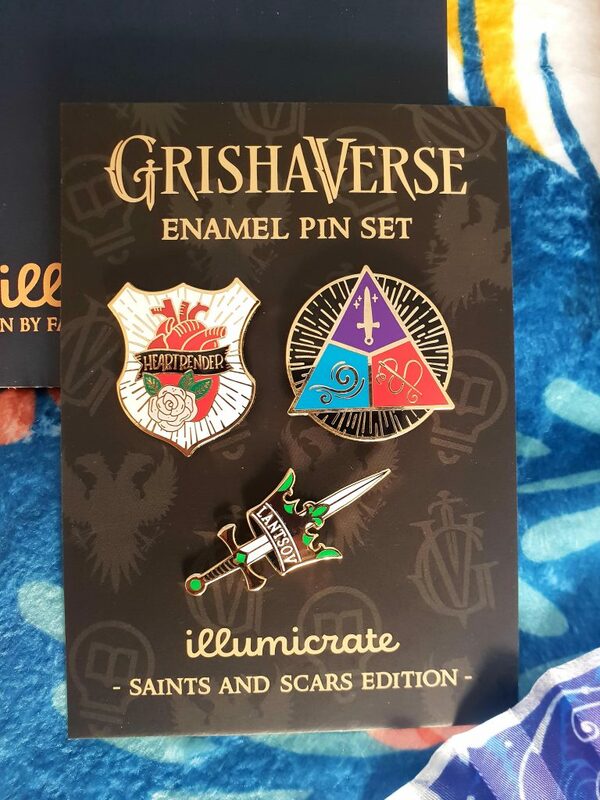 Despite arguing with myself about the Grishaverse not being one of my favourite fandoms, I couldn’t resist grabbing a box whilst they were still available. The Illumicrate special edition boxes are amazing so I knew that there would be items that I would fall in love with. Did it live up to the hype? Here is my unboxing! The Saints and Scars box felt a bit like Mary Poppins’ handbag as I pulled new items out with so many different things included. Every item is very high quality, which I have come to expect from Illumicrate special editions. The artwork for the box, as shown in my title image, was created by the very talented Aeentee. I’ve never received a blanket in a book box before and I was thrilled to find one included. I had hoped there would be a blanket after one of the clues Illumicrate gave on social media. I love the fox design, which was illustrated by Yoshi Yoshitani. It is really cute yet doesn’t scream ‘fandom’ so it can be appreciated by everyone. It is SO soft that I wish I could have spent all day curled up under it. My partner immediately attempted to steal it but he isn’t the cunning fox he thinks he is! Nikolai themed items were a given but I didn’t expect a plush of him. He is cute, cuddly and I’m sure will be featuring in many Instagram posts. 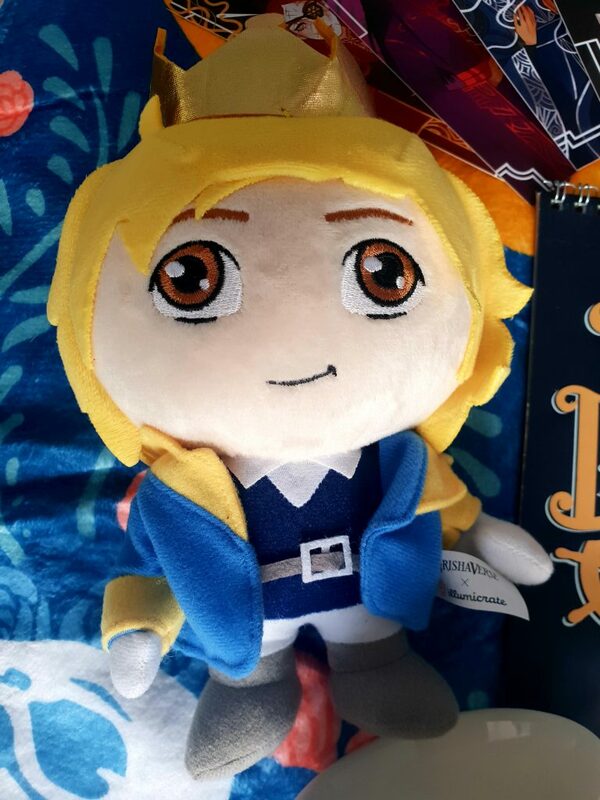 The Illumicrate team designed him in house so the plush is completely exclusive. How cool is that? Layered candles are my favourite as they look so pretty on my shelves. 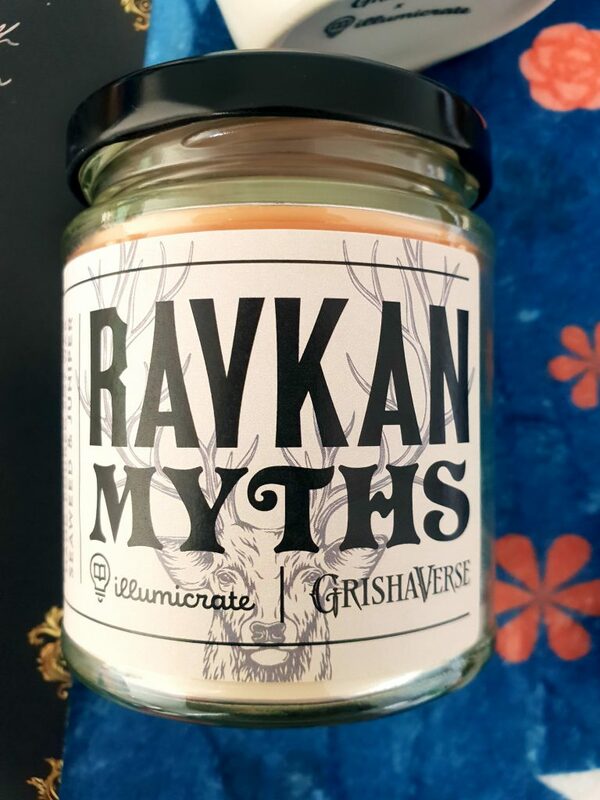 The candle was designed by Flickerink and was inspired by the ‘magnificent creatures of Ravkan Myths’. It is seaweed and juniper scented, which is unusual. I can’t pinpoint what the scent reminds me of but it is not one of my favourite fragrances. Scents are very much down to personal taste and I am sure a lot of people will love it! 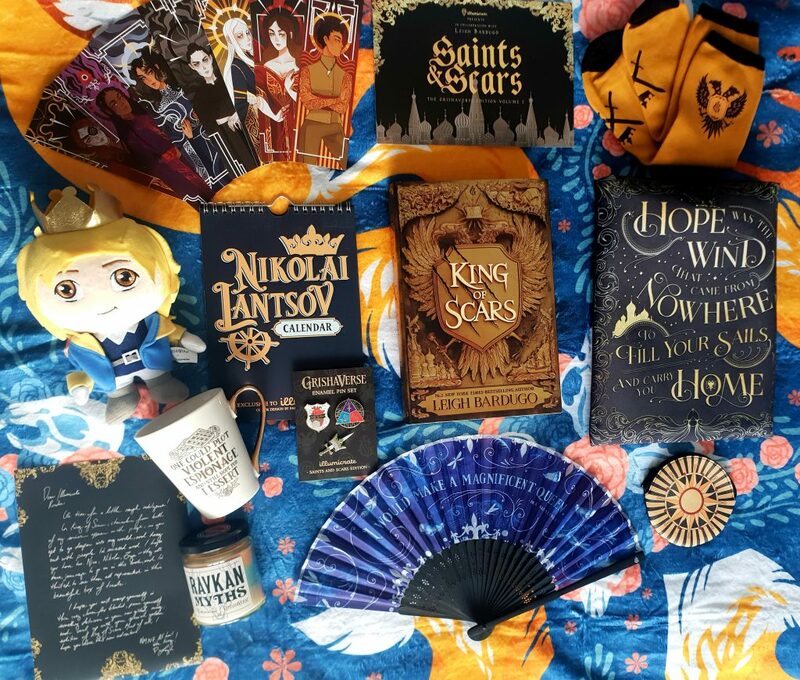 Fable & Black are one of my favourite bookish shops so I am really pleased that they have designed multiple items for the Saints and Scars box. Firstly, there is a set of three enamel pins and they are all lovely. I honestly don’t think I could even pick a favourite. It is nice that they are all very different and I look forward to putting them on my pin banner. Secondly, Fable and Black designed a pair of socks as ‘the finishing touch to your privateer disguise’. Although socks don’t seem like a very exciting item, I really like them! The socks from the Starfall box are some of my favourites and these are the same high quality. I love that they used the colours from the book’s design and kept the design on the socks simple. My favourite item by Fable & Black in the box has to be the mug. Mugs are fairly common place is book boxes but this is the prettiest one I have ever received! 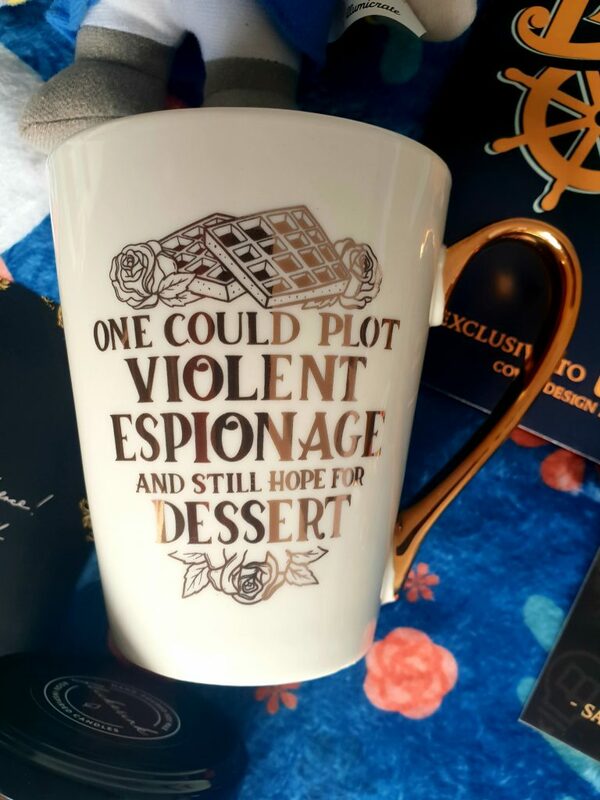 The glossiness and gilding is perfect, as is the quote they decided to use “One could plot violent espionage and still hope for dessert”. Lastly, they designed a small case to use for coins or small items like earphones. It is inspired by Genya’s sunburst eyepatch and will be handy to have around. 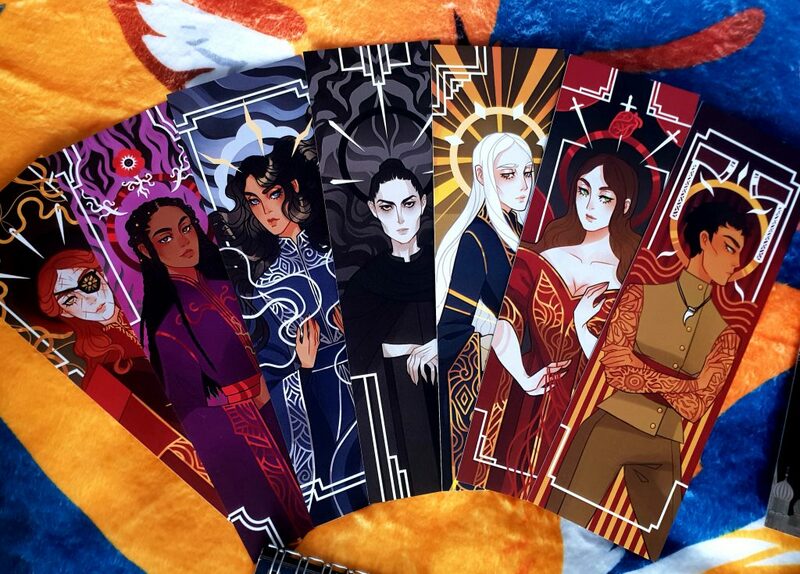 When Illumicrate announced that Monolime was designing several pieces of art for the box I thought that it would be another set of tarot cards as they are very popular in book boxes right now. Tarot cards don’t really do anything for me. Luckily, I was wrong and instead received a set of bookmarks. One can never have to many bookmarks! The art is lovely and really captures some of the characters. The bookmarks feature: Alina, Baghra, Genya, Nina, Tamar, Zoya and Leoni. I love the idea behind this item! 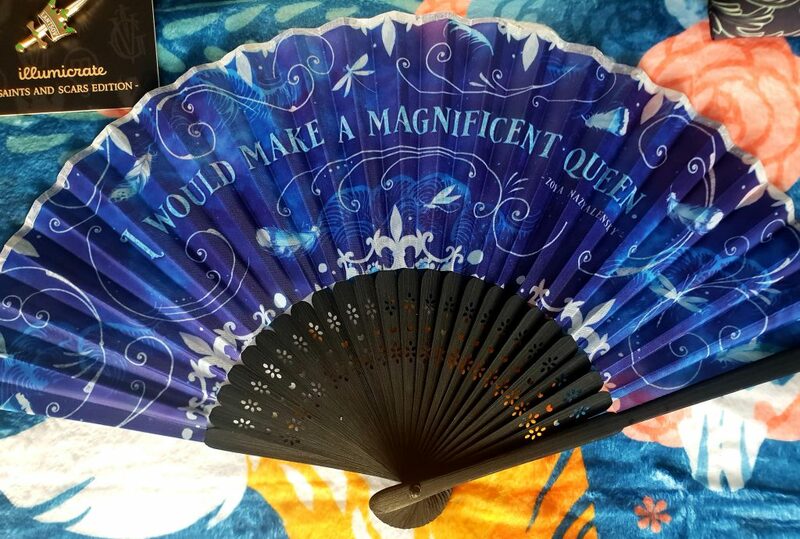 On of my favourite bookish designers is Stella Bookish Art, who designed the fan. This will come in really handy in summer and if I finally make it to YALC, I suspect I will not be the only one carrying this around. I love the originality of the item, it is a very good inclusion. Another item you can never have too many of are book sleeves. They are so useful to have when travelling! 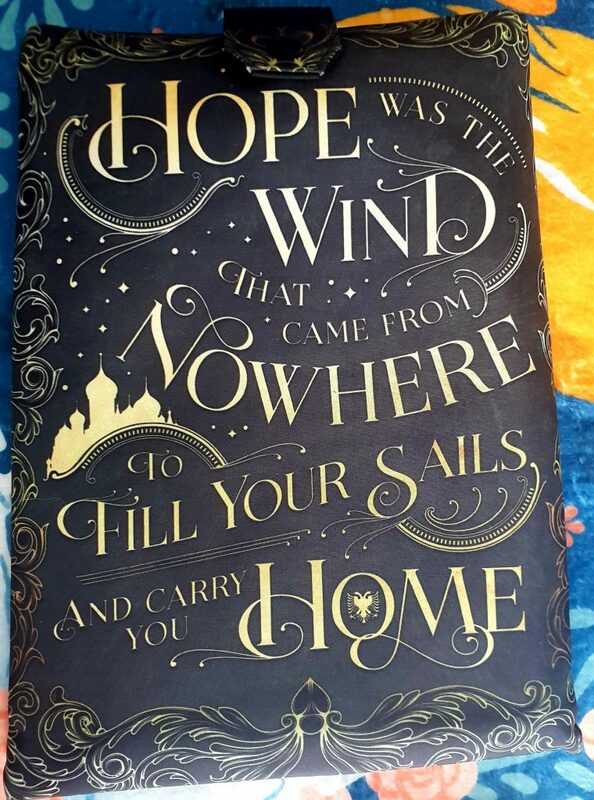 This one is designed by Chatty Nora, featuring the quote “Hope was the wind that came from nowhere to fill your sails and carry you home”. It is a beautiful quote and the design is simple so the typography is the main focus. Unlike any other book sleeves I own, this one has a pop button that goes over the top to keep your book securely inside, which is a really nice feature! The fabric is lined and very thick for maximum book protection and durability. I love that Illumicrate packed King of Scars inside the book sleeve to protect it whilst in transit. They have done it with previous boxes and I think it is a really nice touch. 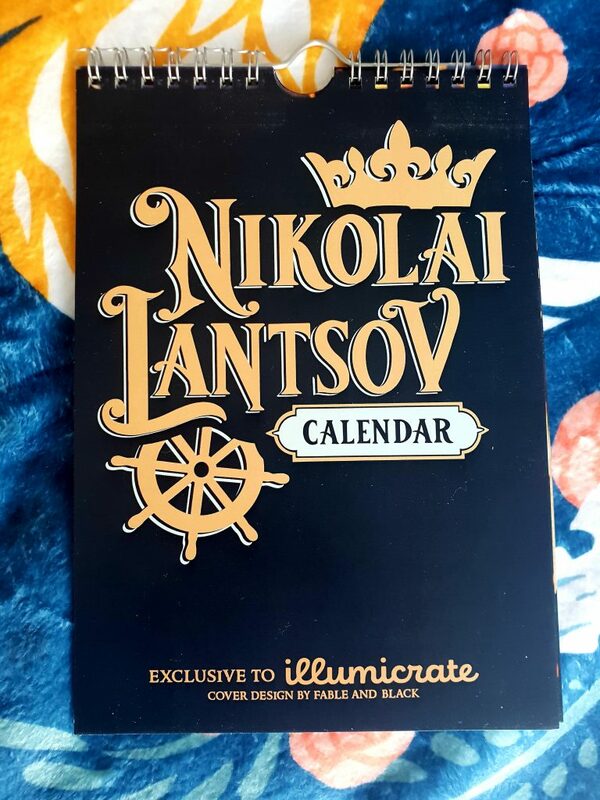 If you love Nikolai then this is the calendar for you! It showcases multiple artists and their interpretations of my favourite Grishaverse character. There is a really nice mix of designs. The most important part of a book box is probably the book itself. The reveal of the special edition of King of Scars is the reason I bought the box in the end. The reversed colours of black on gold under the cover is really nice but my favourite part is that there is a quote on the spine! 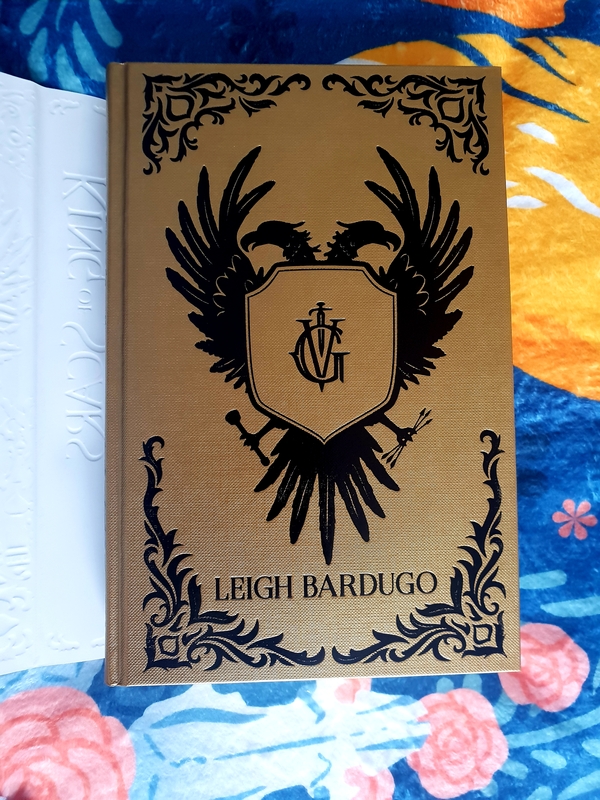 A lovely touch is the letter included from Leigh Bardugo. I am really looking forward to a long reading session. Having received the Starfall box last year I didn’t think that Illumicrate could top it. I was wrong! The item selection is so well balanced in the Saints and Scars box that it has now taken top spot. My favourite item overall is the blanket but there are so many items that I love in this box. The box was not cheap at £62 but was it worth the money? 100%. It is a testament to them that I bought this box when I am not a huge fan of the original series. It is clear that a lot of thought, planning and care goes into their special edition boxes and I don’t hesitate to recommend them. In my opinion, they are currently the best one-off boxes on the market and I always look forward to seeing what they have in store for us next. Did you receive the Saints and Scars box? What did you think? Let me know below. If you are not familiar with the the Grishaverse and would like to learn more my review of Shadow and Bone is here. I always like looking at unboxings even though I am not one for book boxes. I don’t know what would make me buy a book box either. This one looks fabulous though! 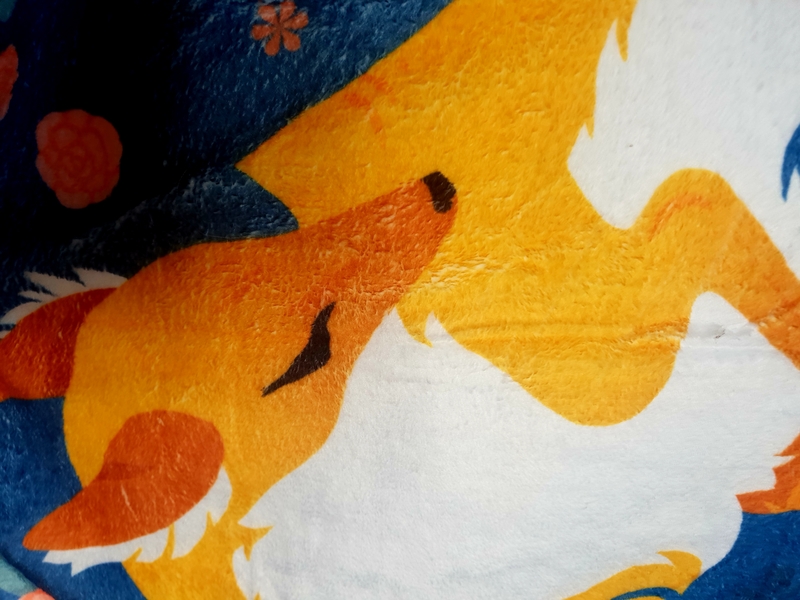 Omg I love the fox blanket. I have a special connection to foxes that is kind of a long story, but I will basically just say that they are my spirit animal. Even though it doesn’t “scream fandom” I would absolutely love that item. This is probably one of the best unboxings I have ever seen in terms of descriptions and items. I love unboxings and this looks like an amazing book box. I like how you have gone into detail about each item. Lovely post! Thank you! It was an amazing box 🙂 I’m really pleased I ordered it. This was such a nice box! I’m so sad because I couldn’t get it, since they don’t ship to my country sadly. But it was nice to see an unboxing of it! That is a shame! I wonder if they would consider shipping to you in the future? They seem to be making changes with going from quarterly to monthly on their main boxes. If there were any items your were particularly interested in then they are appearing on the b/s/t pages on Facebook already 🙂 You might be able to grab the things you like most. I’ll definitely keep an eye out for that! And hopefully they will soon ship to my country too! You definitely should! I love a good unboxing post. I think they are really nice for when people are considering getting a box for themselves but want to get a feel for the items in different boxes before they choose one. I am very tempted by the Harry Potter Lootcrate Hogwarts Express special edition box! I haven’t read the Six of Crows duology yet. To be honest, I think the original series is overrated (boo hiss xD). I hope you enjoy it if you get around to reading it though. The mug is really pretty! They always kill it with their boxess! So sad I missed out on this one! They may have a few left over once all of the main boxes have been delivered if no replacements are needed. Caitlin from Illumicrate is creating a wait list I think if you wanted to be added 🙂 I honestly wouldn’t have bought a King of Scars box from anyone else but they really do kill it with their special editions. So looking forward to reading King of Scars. But I need to finish the rest of the Grishaverse books first! That blanket is awesome and I love candles! Sounds like a great box. So much is included in this box, the blanket is so cool! I absolutely loved this box, I think my favourite items were the mug and blanket. I loved how the calender can be used every year too. I am glad you loved yours too. Illumicrate did an amazing job. The mug and the blanket are perfect! WOW! This box looks amazing!I especially love fan (handy thing)! The fan was such a lovely addition as it was so unexpected yet completely works with the theme of the box!